Whether you’re a beginner fisherman or a seasoned angler, the best fishfinder for kayak is a great tool that will help you improve your catch. Kayak fish finders work similarly to fishing boat fishfinders. However, because kayaks are lightweight and don’t offer as much space as most other watercrafts, these devices are specially built to fit into your boat. They come with good sized LCD screens for easy viewing and will tell you if you’ve found fish and how deep they are. Some also give you information on the fish size. Below is a summary of the products that work best. These products offer high performance and accuracy. Plus they’re lightweight and easy to install on your kayak. Here’s a link to go to the best kayak fish finders listed on Amazon.com. This is a good product for anyone who likes to go fishing on their kayak. Because kayaks don’t offer a much space as many other types of boats or watercrafts, this unit’s compact and lightweight design make it a good fit. The Lowrance Elite-3x Fish finder is a great lightweight choice for kayakers. It physically measures just 10 inches long making it very easy to fit even into a 10 foot kayak. The device also comes with a good sized 3.5 inch color screen. This way you can easily spot the fish visually through the LCD. The display also offers variable brightness. This makes it much easier to read even in bright sunny conditions. The adjustable brightness makes it likewise comfortable to use for night fishing. This Lowrance offering also has a temperature gauge that lets you know the temperature of the water. This feature is a great addition especially when you want to venture into chilly waters. With it, you’re aware of the water temperature at all times. And, have some sort of incentive to not flip over your kayak! The unit’s basic button controls are located beneath the screen. This positioning makes it easy to navigate through the menu and change the frequency settings when needed. The device also comes with a mounting bracket as well as a combination power cable and transducer. As far as weight goes, it weighs just 3 pounds. From one of the most popular names in GPS navigation, the next item in our fish finder reviews is this offering from Garmin. The Garmin Echo 101 is a lightweight and easy to use fishfinder. It is one of the best options for anyone who’s on a budget. Yet, wants something reliable. We like the Echo 101 because it offers an affordable option with great performance. This makes it a very practical choice for many kayakers. The low price also makes it a good choice for beginners. The device measures just under 6 inches long, and it with a 4 inch display screen. What makes this a strong consideration for the best kayak fish finder is its bright and crisp screen as well as the numerous display options it has. Among its features, you can choose it to display fish as an arch, or for it to indicate size and depth. This device is a single beam transducer that will work up to a depth of 1,500 feet. This Garmin fish finder is powered by one 12 volt battery, which will offer you up to around 5 hours of battery life. It is very lightweight as well, making it easy to add to your fishing kayak. Overall, this is an unassuming looking model that offers high performance which rivals fish finders of much higher prices. Unlike many of the items here in our best fishfinder for kayak reviews, this one isn’t a standalone electronic device. Instead it is placed in the water and works wirelessly with your mobile device. The Deeper Fishfinder compact device. It is a wireless fish finder that works with your smartphone or tablet via Bluetooth and installing a free app. The unit is compatible with both Android and iOS. This allows you to easily get any updates from it. And, at the same time keeping your fish finder at top performance. This portable fishfinder comes equipped with built in dual beam transducer. 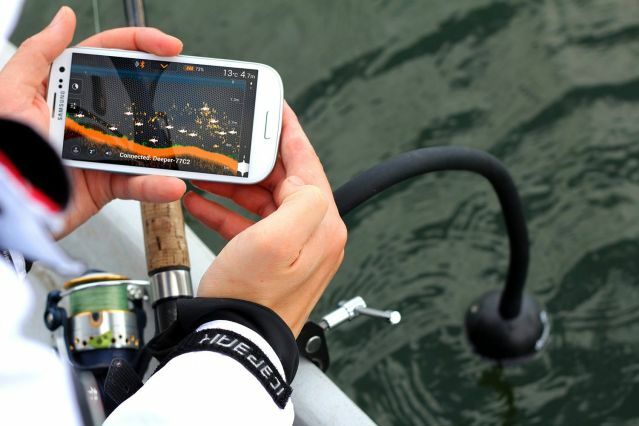 The compatible app that comes with it also provides you with a greater range of options than traditional fish finders. With this fishing detection device, you’ll be able to take advantage of a fish activity calendar, fishing log, weather, maps, as well as an integrated camera and sharing capabilities. The unit charges via a USB cable that can be purchased with or without the Deeper Fish Finder. There is also a flexible mounting arm that can be purchased. However, this fishfinder can just be attached to parachute cord or strong fishing line and hung from the side of your kayak. This way you don’t need to get the extra mounting arm. This portable fish finder measures just under 5 inches long and comes with a built in 2.8 inch LCD screen. It offers big/small fish identification, depth of the fish, and bottom contour. These indicators help to give you an accurate understanding of what’s beneath you. This information work to help you to know where to stay. And, catch more fish once you’ve found them. The device allows you to easily change between unit measurements, namely meters and feet. Also, you can change the language and the background color as well based on your preference. This fish finder runs on four AAA batteries. And, it weighs just under 1 pound. The transducer of the device can be permanently mounted to the side of your kayak. This is made possible by the mounting apparatus that’s included in the package. Or, it can be attached with a suction cup mount. This fishfinder works in water as shallow as 2 feet and as deep as 240 feet. DASH Diet vs. Mediterranean Diet: Which is Better?